A confession: Arts journalism is as much an exercise in clairvoyance as it is in looking. Deadlines weren’t designed to accommodate serious contemplation and, in the case of a preview article (such as the piece you’re reading right now), an assessment is sometimes made before the art can even be seen. One is constantly sussing out what’s "good" via the pixellations of a JPEG. Isabel Mattia refreshingly thwarted this formula. I first spoke with the Rhode Island School of Design MFA candidate on a windy day last November. She admitted uncertainty about her upcoming exhibit at Hunter Gallery. It would probably be an installation that used all of the intimate, small space. But what else? Steel would appear — but how, exactly? Would other materials be involved? Mattia knew she wanted to draw in space — her works are hybrids of sculpture and line work — though she didn’t yet know what she would draw. Beyond the basic data, Mattia was content to speak from the place of tremendous potential that is the nascent artwork. Strewn about Mattia’s studio space in downtown Providence was a disassembled installation, “Baby, I Love You and That Rainbow Ball.” There was a big green snake, rainbow footballs, a feather gradating from pink to yellow like some kind of beautiful, living software logo. 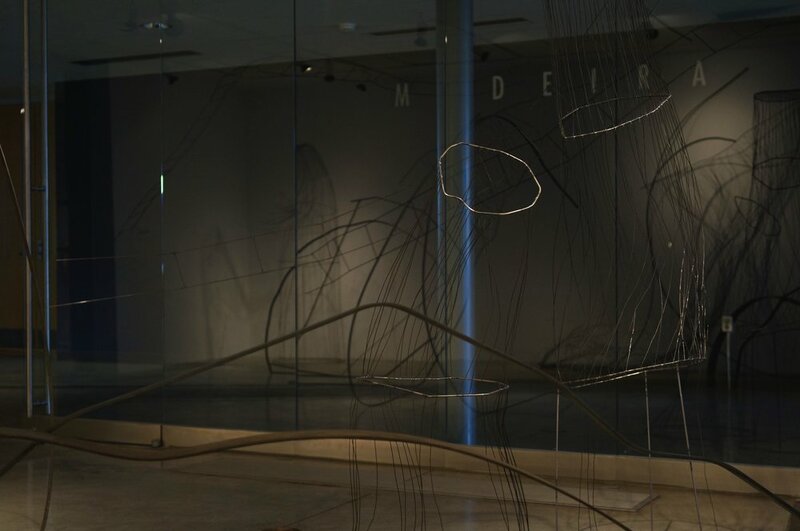 When installed, these objects hung from the ceiling or on twisted lines of wire. Collectively, they became a transcendently goofy diorama, a joyful exposition of space. Mattia warned me that the cornucopia of color before my eyes was not typical of her work. 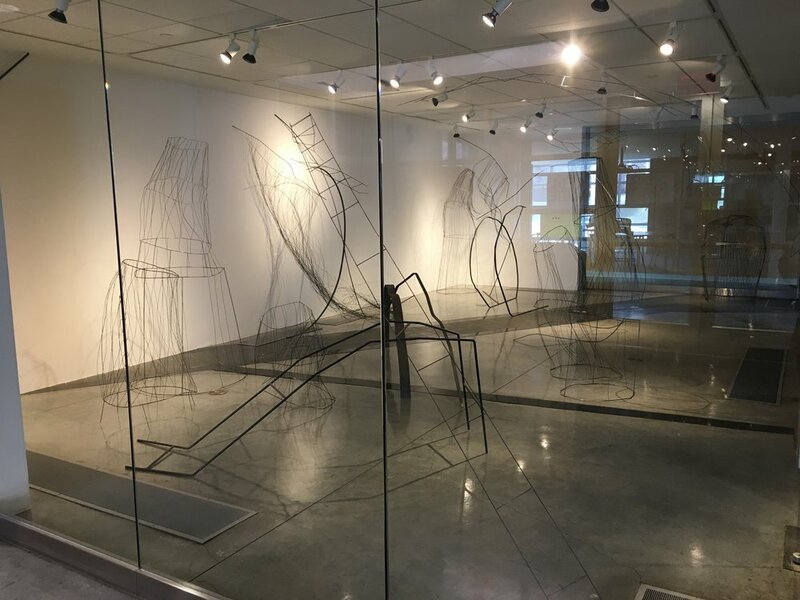 Despite some similarities in construction, it’s true that “Baby, I Love You” is markedly different from Mattia’s more subtle “trace/erase,” soon arriving at Hunter Gallery at St. George’s School. 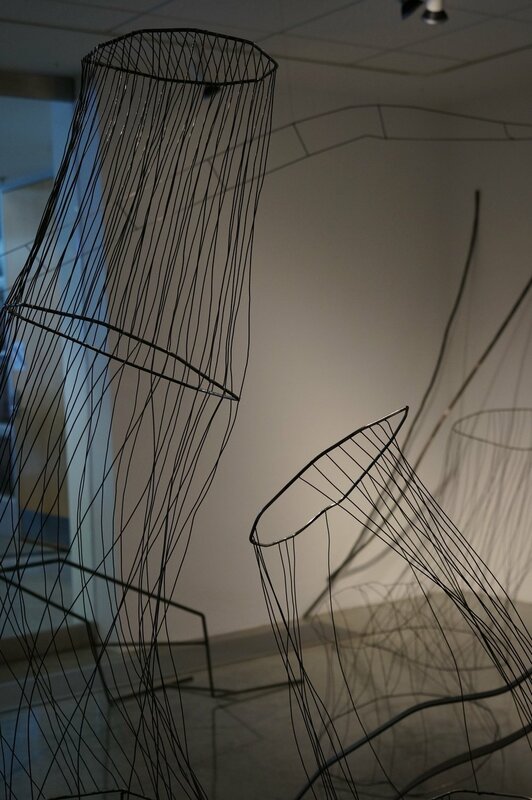 The show runs from Feb. 2 to March 2, with a reception on opening night at 6:30 p.m. 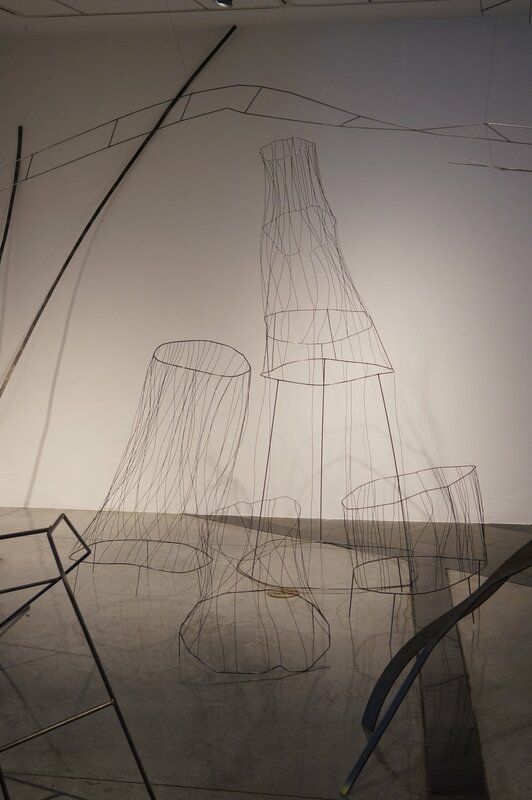 When I spoke with Mattia again, a little more than a week before her opening, “trace/erase” wasn’t finished. Mattia was still pondering the proper amounts of “tightness” and “breathing room” to employ, as well as the possible inclusion of some flat, 2D drawings, perhaps on the walls. But will there be steel? Yes (as well as thread and rope). Drawing in space? Yes. 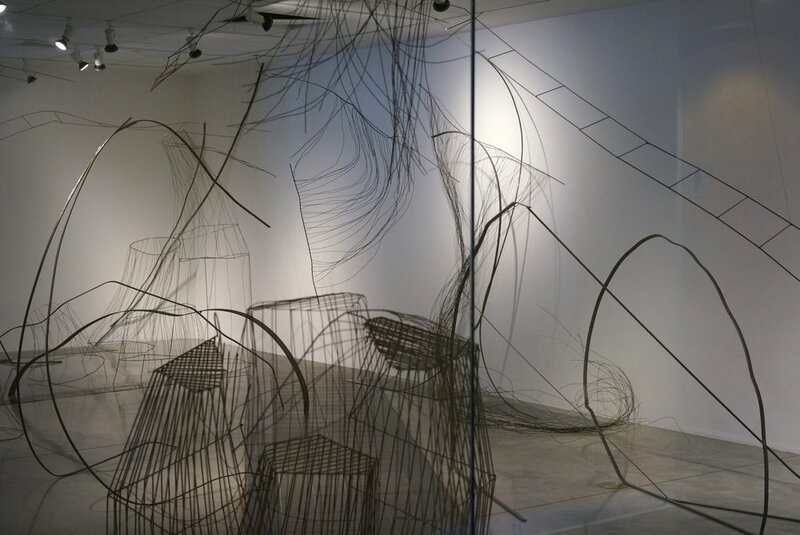 Sculpting with lines of wire? Yes. 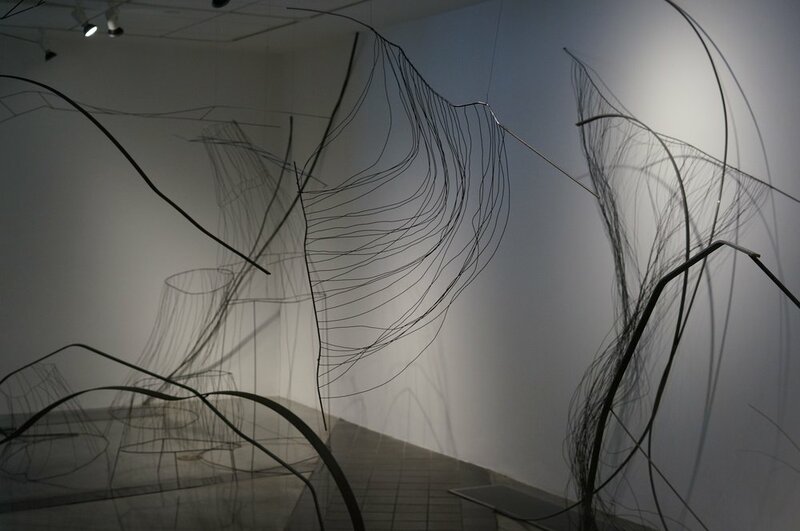 “trace/erase” will be a sibling of “Sketchbook,” a more recent installation that crowded together black wire forms in a lively spatial intervention. 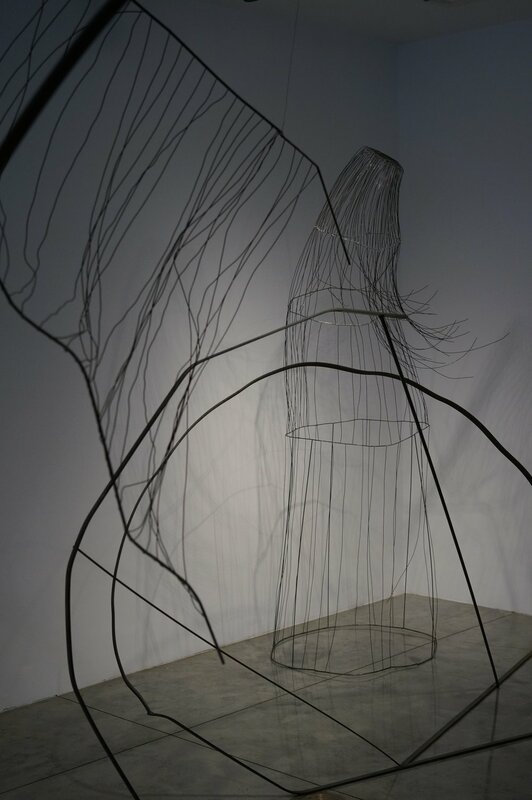 Both “Sketchbook” and “trace/erase” attempt manifesting the ethos of drawing through sculpture. Mattia’s latest work is an elegant revolt against the predictability of space and forms, aesthetic or human. In an ideal scenario, a student — queer, questioning, or otherwise — might absorb from Mattia’s work the idea that it’s OK to be uncertain or not know. 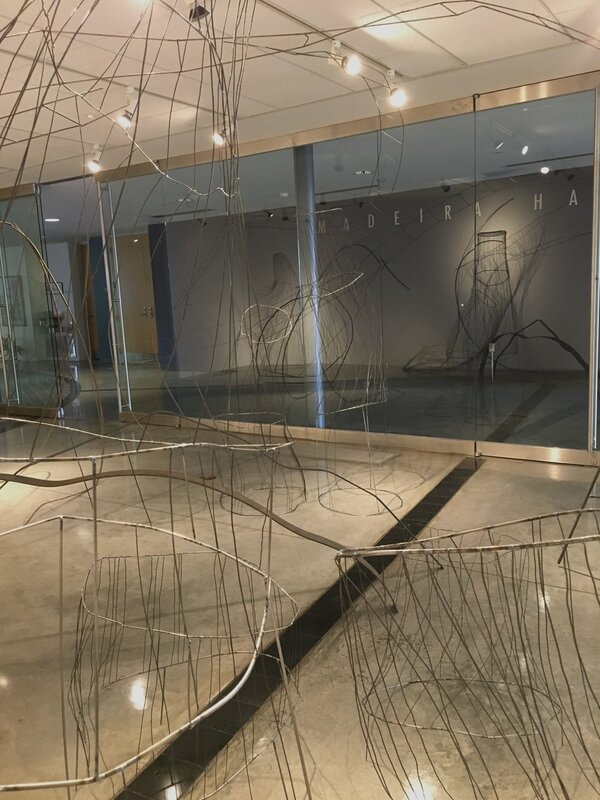 Apropos of this, Mattia has been corresponding with the St. George’s Spectrum Alliance and is hoping to collaborate with them while her show is on view. So I’ll loosen my usual viselike grip on copy and say: I’m not sure how this story should end. I haven’t seen the final installation. Nevertheless, all thrill resides in the yet-to-come, so I’ll make one more prediction: Whatever Mattia builds will be worth seeing.